For all of the article writing and blogging and industry discussion on disaster recovery, one might assume businesses are all over this. They have the tools, the plans, and the budget, and they’re building solid, foolproof DR plans that actually work. Well, not so much. In reality, businesses are still making some disturbing mistakes, and these mistakes make it difficult to nigh impossible to fully recover after a serious issue. Here are the most common ones you need to avoid. If your DR plans were born and raised in IT, with no outside influence from the business side of things, it is almost guaranteed to be inadequate. Disaster isn’t an IT problem, it’s a business problem. Be sure your plans address the needs of the entire business. Along this line, it’s easy to assume that your sales folks are most concerned about getting their CRM system back online, that HR is most interested in their HIRS coming back up. In reality, they may be more interested in accessing their email, schedules, and calendars, or even a database than these systems. You won’t know if you don’t ask. Businesses tend to get wrapped up in a reactive frame of mind. For instance, after 9/11, many businesses invested tremendous resources in disaster recovery sites. Since then, not many have needed those recovery sites, but all have probably wished they did more to protect against data breaches. Don’t get so wrapped up in trying to protect against the last disaster that you fail to look ahead to see what may come next. 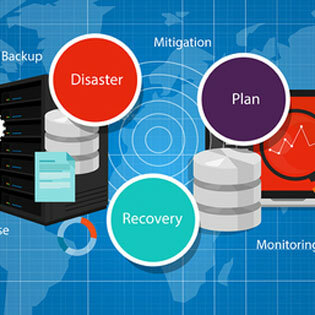 Disaster recovery has much less to do with servers and applications and networking equipment, and a whole lot to do with the people that operate it. Any disaster recovery plan that fails to include the needs and condition of its people is, by nature, inadequate. Plan for taking care of your people and you’ll be amazed at how well they care for your business, its systems, and its customers. It really does no good to cook up a bogus disaster and conduct a ‘walk through’. Real disasters are unforeseen and unforeseeable. The best approach is to make sure everyone has a role and knows what they are responsible for restoring after a disaster. Then, support your staff with what they need to do those tasks. Now you have a viable, workable disaster recovery plan. They can adapt their roles to fit any situation, and you don’t have to bother outlining every potential disaster that could ever possibly befall your business. Many businesses strive for nothing less than a 100 percent restoration of their data. Not only is this almost impossible, it takes a tremendous amount of effort that is probably best spent somewhere else. Identify the data you truly need to continue mission-critical functions. After that is restored, your teams can get on with other essential tasks. When things are back to normal operational status, they can work on retrieving that not-so-critical data. If they don’t, at least you’re back to business as usual. When creating your disaster recovery plan, don’t forget data that is tucked away in silos. For instance, finance probably has some spreadsheets stored in their own systems that aren’t readily accessible and maybe not even known outside that department. Talk to the users. Find out where they stow away important data and make sure it’s backed up and logged as critical during restoration. Are you aware that you don’t have to do disaster recovery all on your own? IT managed services is a tremendous value, particularly for small- to mid-size businesses that don’t have endless resources to pour into it. Learn more when you download the white paper: Managed IT Services For Small Businesses.